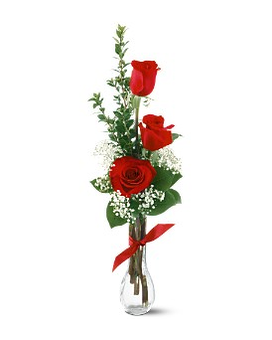 This bud vase of red roses is the perfect way to make someone's day. Three red roses arrive in a clear vase topped off with a ribbon bowtie! Standard : 3REDROSE greeting cards & balloons NOTE that all balloons and greeting cards purchased with a flower arrangement will not incur a second delivery charge.